You know I have re-thought my vote for homeliest female celeb and it’s no longer Rosie Perez. Now we have Amy Winehouse. Seriously that is her au naturel. How does a girl go from an absolute bombshell to an absolute bomb? Yikes! Anyhoo. Amy is an English singer-songwriter, who mixes cool mix of musical genres including R&B, soul, and jazz. It’s impressive stuff too. Doubtless this woman is very talented….for now. But if she keeps frying her brain with heroin and going on drinking benders that could rapidly change. Winehouse’s 2003 debut album Frank was successful in the UK and was nominated for the Mercury Prize. Her 2006 follow-up album Back to Black (irony) netted her six Grammy Award nominations and five wins. Not too shabby, Amy, unlike your appearance. I guess looks truly are deceiving. Back to Black has the distinction of being the third biggest seller of the 2000s in the UK. I simply must twitter, oops, I mean titter over this: in 2007 she won the Ivor Novello Award (don’t ask me) for her single, Rehab. Um, apparently art doesn’t imitate life on Amy’s agenda. In 2006 Back to Black was released in the US and it landed at #7 on billboard 200. Wow. She kept on raking in all kinds of music awards. I can only image what her fireplace mantle must look like. To see Amy in her Rehab video click here. Amy released Amy Winehouse – The Girl Done Good: A Documentary Review on 14 April 2008. It featured interviews with people who knew her and helped her gain success. In 2008, Universal Music pressed her for new material but as of September 2, Winehouse had not been near a recording studio. At that point Amy’s career took a nosedive. I believe that’s how she ended up with that grimace. To see Amy Winehouse: The Girl Done Good click here. Amy toured the Back to Black album’s release but she didn’t do well. In November 2007, opening night was greeted with boos and walkouts. A music critic stated it was “one of the saddest nights of my life…I saw a supremely talented artist reduced to tears, stumbling around the stage and, unforgivably, swearing at the audience.” Other concerts also ended poorly and on November 27, Amy she announced she had cancelled her public appearances for the remainder of the year. Concert promoter Live Nation blamed “the rigours involved in touring and the intense emotional strain that Amy has been under in recent weeks” for the decision. Yeah, we believe you. To see Amy Winehouse in Bloody Brawl click here. To see Amy Winehouse – Rock in Rio 2008 click here. Amy’s personal life fell apart. She married on-off boyfriend Blake Fielder-Civil on May 18 2007. Fielder-Civil was a “dropout” of Bourne Grammar School. 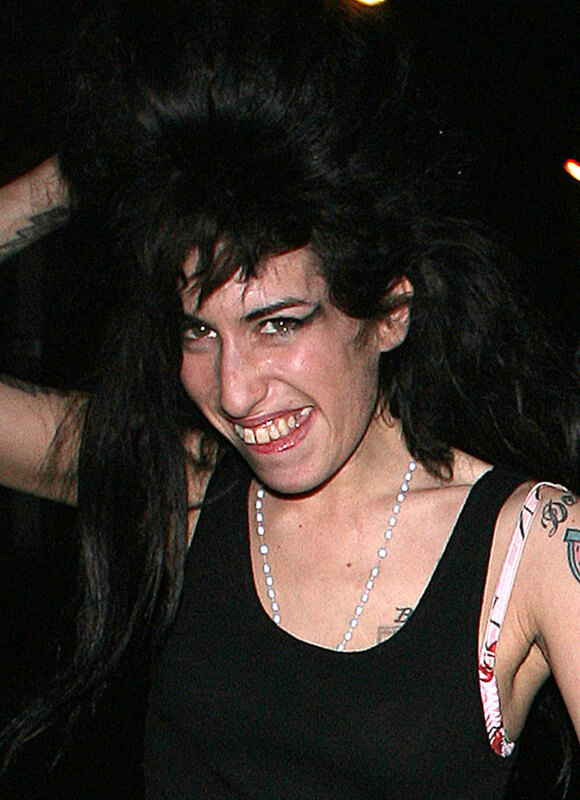 In a June 2007 interview, Amy admitted she was violent towards him when she was intoxicated. 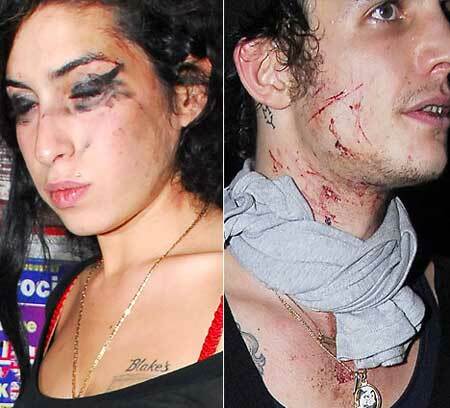 In August 2007, they were photographed, bloodied and bruised after a fight, although Amy tried to brush off her injuries as self-inflicted. What about his then? Her parents publicly reported concerns,in particular that the Amy and Blake might commit suicide. Fielder-Civil was quoted in a tabloid saying he got her hooked on crack cocaine and heroin, a potent combination that led to her current, gorgeous appearance. During a visit with Mitch Winehouse (Amy’s father) while in prison, Fielder-Civil reportedly said that he and Amy would cut themselves during withdrawal. Fielder-Civil was imprisoned for trying to pervert the course of justice, and for grievous bodily harm. By that time Amy had found herself a new beau. Soon afterward Amy’s spokesman confirmed that “papers have complete forgot [she] was married”. Fielder-Civil’s sued Amy for divorce on the grounds of adultery. 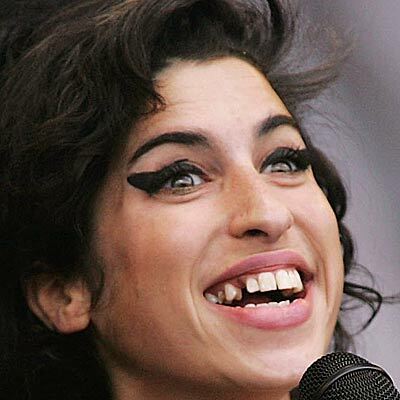 To see Amy Winehouse’s Disastrous Face click here. 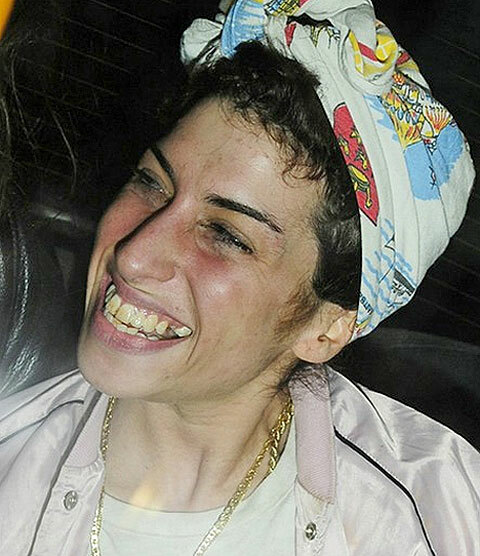 To see Amy Winehouse caught taking crack click here. 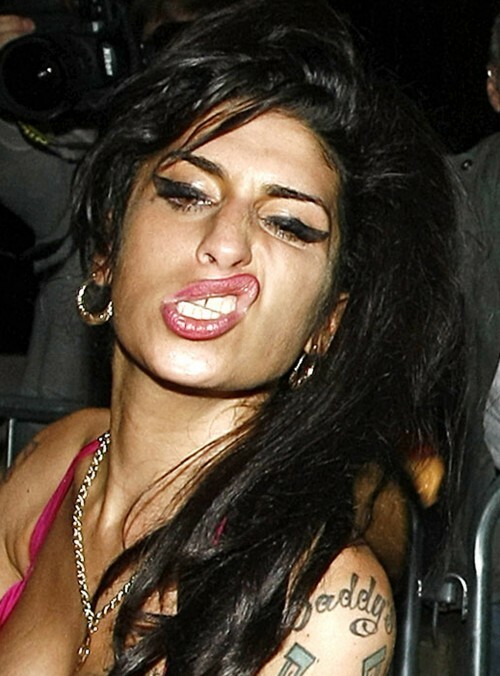 Amy’s ongoing battle with substance abuse are a popular subject of media attention. As if that wasn’t bad enough, Amy admitted to having problems with self-harm, depression and eating disorders. You don’t say. Just to give you some idea of Amy’s severe weight loss check the before and after photos. Her before photo is gorgeous; she has curves Marilyn Monroe would envy. In 2005, Amy went through a period of drinking, heavy drug use, violent mood swings and weight loss. Her family claimed that the death of her grandmother set her off into addiction. Not likely. It was her husabnd who got her into it and her own decision to pursue it. To see Amy Winehouse gets Flowers from Blake click here. In August 2007, Amy cancelled shows, citing exhaustion and ill health. She was hospitalized for an overdose of heroin, ecstasy, cocaine, ketamine and alcohol. Sounds like she’s following in Anissa Jones’ tracks. Amy told a magazine that it was her drug use that led to her hospitalisation and that “I really thought that it was over for me then.” That gorgeous pic on the left is Amy with a heroin hangover. To see Amy Winehouse Argues with a Taxi Driver click here. 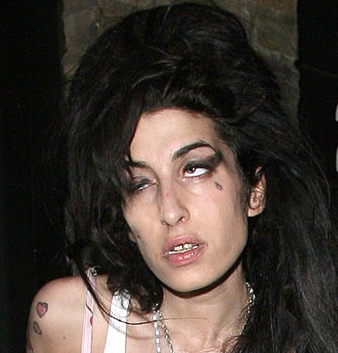 To see Ex-husband claims Amy Winehouse nearly died after drug binge. 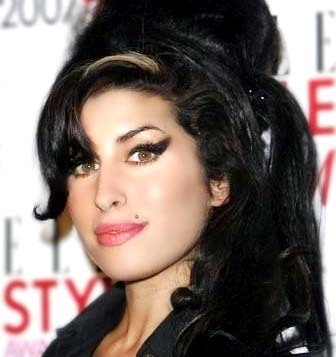 Amy released Saving Amy, an autobiography about her recovery from substance abuse as a paperback book in January 2010. Amy collaborated on a fashion collection with an internationally known designer. It was released in October 2010. Good god. Of course, her designs may come in handy for Halloween. Comeback Grade: W for we’ll see about that. To see Amy Winehouse Smokes a Joint and Fights click here. To see Amy Winehouse’s New Blonde Hair click here. To see Amy Winehouse interviewed by another freak, Kelly Osbourne click here. **Update** – of course unable to rehabilitate herself from her substance abuse, Winehouse passed away in 2011. On the evening she died, an out-of-control Winehouse is said to have taken heroin, XTC, cocaine, ketamine and alcohol. What a waste of talent. This entry was posted in Celebrities Who Bottomed Out and tagged Amy Winehouse, Back to Black, Grammy Award, Ivor Novello Award, Mercury Prize. Bookmark the permalink. Amy was an adult, who is capable of making their own decisions. He didn’t tie her down and force her to do drugs and drink. Personal responsibility people. You are an idiot. In the end we are the master of our own destiny. It is always easier to blame someone else, but in the end we must take personal responsibility because we decide what to do with our lives, not someone else. i am still very sad for what happened her. Such a shame ! Wonderful talent and a very original natural talent! Paps enjoyed running her down! Dnt judge til you walk in those shoes! RIP Amy your music is your legacy to the world! Sweet dreams forever miss you baby. I think she obviously had issues. It is cruel to leave this on your website.